Hi there! Just popping in quickly for day three of the November Papertrey Ink countdown to share a few samples using one of the new sets... Fancy Footwork (designed by Lizzie Jones). This unique set really make it easy to create some unique anniversary and wedding cards. I just love how easy it is to incorporate with some other fun previously released sets! Keep in mind that this set will be available for purchase beginning November 15th at Papertrey Ink. 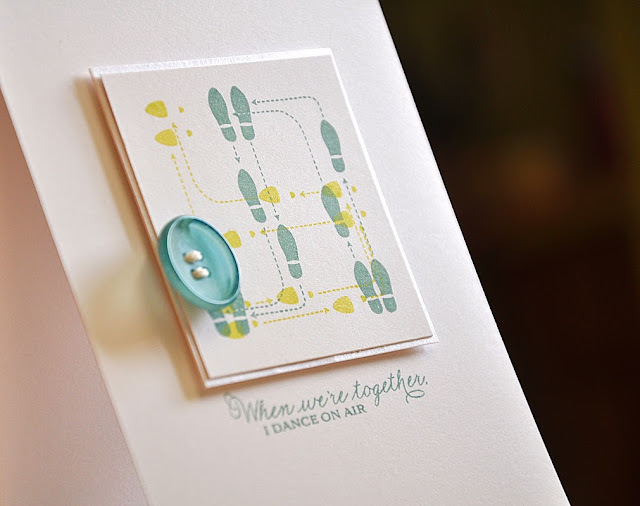 This first card features a Fancy Footwork focal point. I stamped two images (one of a man's steps and the other of a woman's steps) onto a white card stock block measuring 2 1/2" square. I rotated the images in different directions, this way they fit nicely into the center of the square. 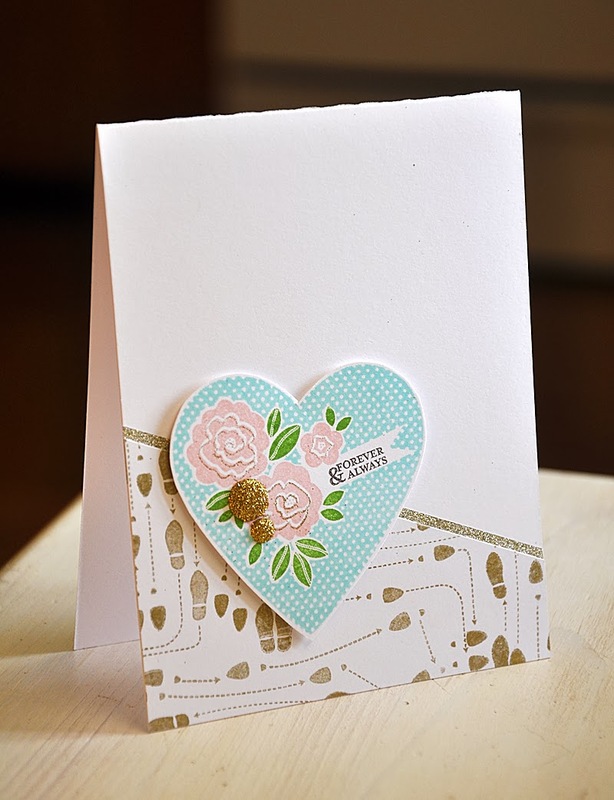 Finished the card off with a simmer white cardstock mat, a sentiment and an ocean tides button. Not too many frills on this one, makes it perfect for the man in your life when celebrating an anniversary. This next one is a bit fancier. I used Fancy Footwork to create a golden hand stamped background pattern paper, stamped using gold ink. I've paired it with a previously released stamp set... With All My Love. 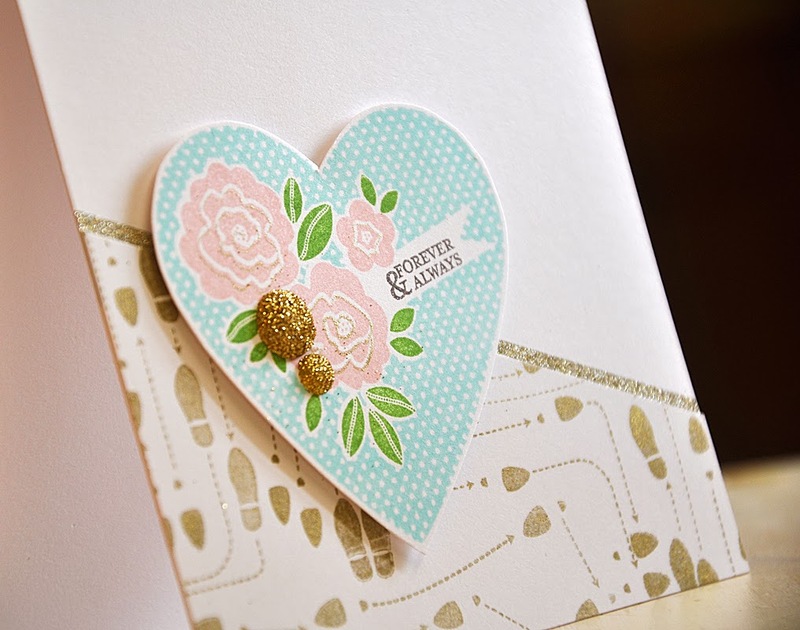 I just love this multi-stamped heart! I finished the card off with a few more fun touches of gold... in the flowers, a strip of glitter paper and glitter dots. This card is perfect for celebrating either anniversaries or weddings. 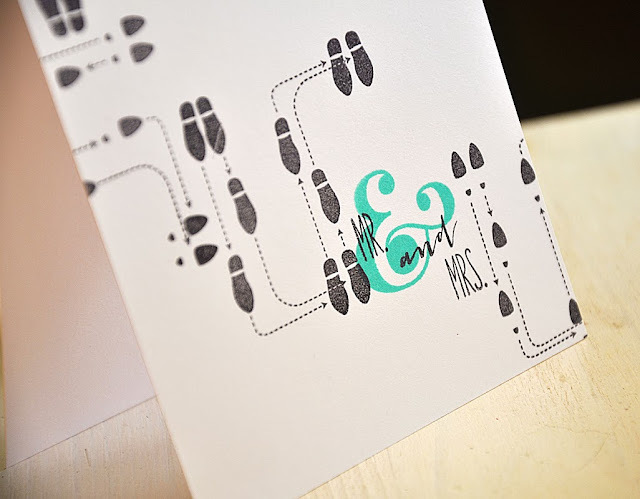 Keeping it simple once more, this time for a one-layer wedding card. 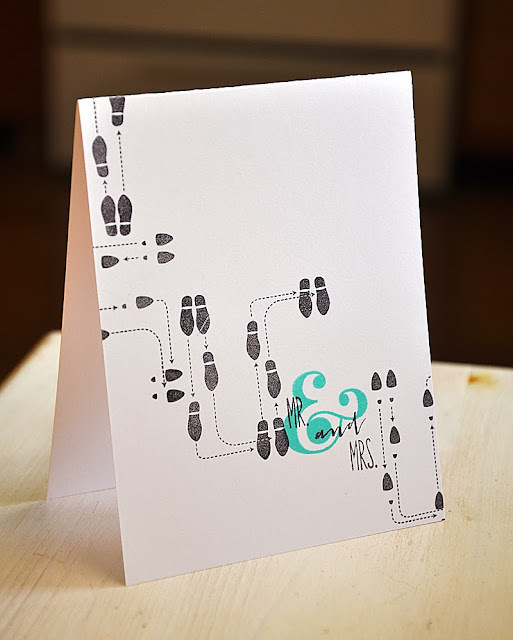 I've combined Fancy Footwork with yet another previously released stamp set... Grand Ampersand. Well, that concludes today's look at Fancy Footwork. Just remember... this sets will be available for purchase through Papertrey Ink, beginning November 15th. In the mean time, I'd love to know what you think, so please feel free to share! Now, be sure to visit Nichole Heady and Lizzie Jones for even more peeks at this set. Also, Heather Nichols, Dawn McVey & Melissa Bickford have peeks to share with you of their newest sets and dies for the month. clean crisp look to your cards, nice! Lovely simple cards - I especially like the first one. Thanks for showing the Fancy Footwork possibilities! Such cute cards and fun designs! I love the colors and the simplicity. Thank you for giving Fancy Footwork such a fabulous introduction, Maile!